WS2-E Engine Flushing Oil is a very effective ester-based engine flushing oil with special detergent and dispersing additives. 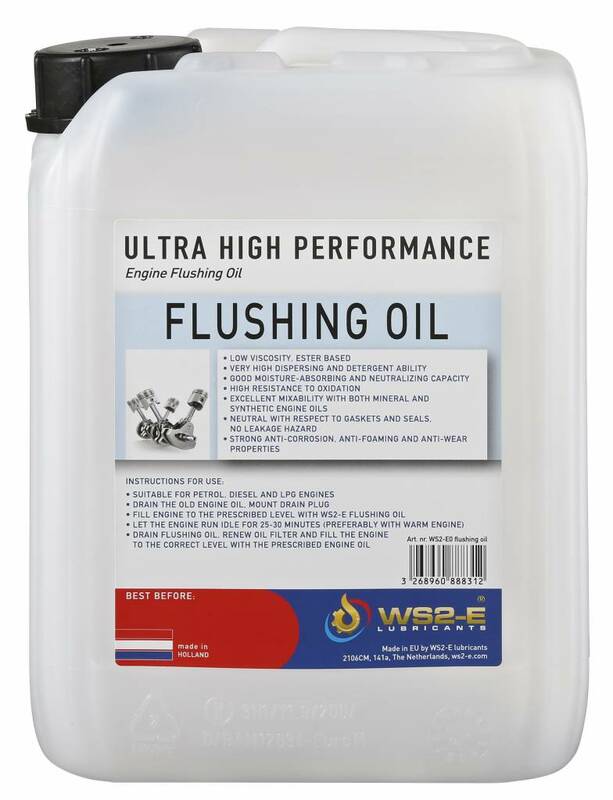 WS2-E Engine Flushing Oil is a very effective ester-based flushing oil with special detergent and dispersing additives. Use for every engine oil change in petrol-, diesel- and LPG engines so the fresh engine oil can handle its task better and the internal contamination of the engine is kept to a minimum. 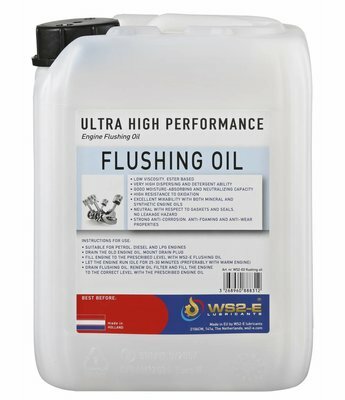 The use of WS2-E Engine Flushing Oil is also recommended with for example an engine intake cleaning so the resulting pollution can be effectively removed by the flushing oil. Detergent and dispersing additives form a large part of the performance package (additive package) of a modern engine oil. 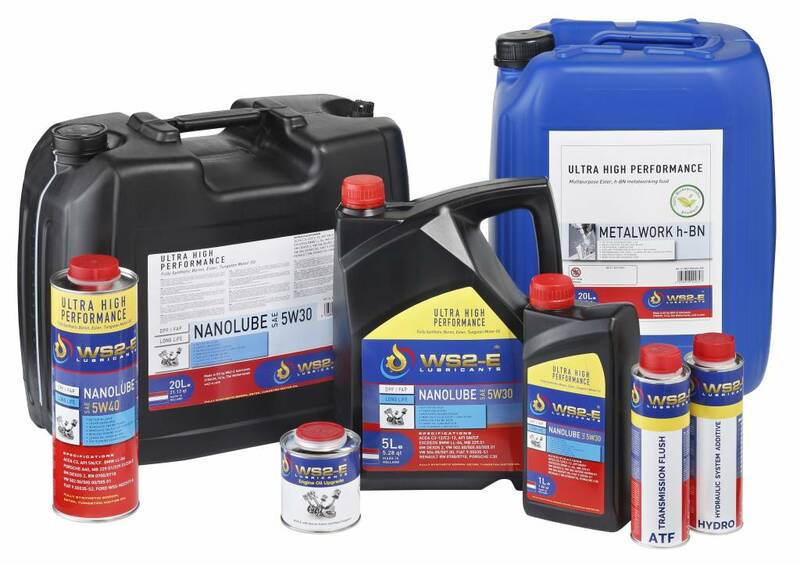 They are used to keep the metal surfaces of the engine clean, to prevent the formation of deposits and to neutralize the harmful effects of corrosive acids formed by the combustion of petrol- and diesel fuels.Draining old heavily soiled engine oil and filling the engine with fresh engine oil while a lot of contamination remains in the engine, oil cooler and oil lines can result in a rapid exhaustion of the additive package of the fresh engine oil. Detergents are oil-soluble basis that are derived from mainly Calcium or Magnesium, they are polar by nature so they will adhere to the surface of particles. The dirt particles in the engine are insoluble in oil and have a higher affinity for the detergent molecule than for the oil molecule, they are attracted to the detergent and trapped in it and kept in solution and can not settle to prevent formation of deposits in the engine. The number of dirt particles that the detergent can bind to itself is limited, when the number of dirt particles exceeds the capacity, deposits can form. Detergents also neutralize acids that are formed by the combustion of fuels. Dispersants are polar additives that are used to spread sludge and soot particles to prevent agglomeration, sedimentation and deposits. The dispersant envelops the particles and keeps them finely divided. Dispersants are polymeric, ashless compounds, based on long-chain hydrocarbons that are acidified and then neutralized with a compound containing basic nitrogen. Removes dirt, sludge and lacquer deposits and cleans the oil channels . Very high dispersing and detergent ability. Mixable with all types of engine oil, prepares the engine for the fresh oil. Neutral for gaskets and O-rings. Strong anti-corrosion and anti-foam properties. Cleaner engine, longer engine life, less maintenance, lower fuel consumption, less harmful exhaust gases. Drain the old engine oil when the engine is warm and refit the oil drain plug. Fill the engine to the prescribed oil level with WS2-E Engine Flushing Oil. Allow the engine to idle for 25 to 30 minutes (preferably with a warm engine). Drain the flushing oil, fit the oil drain plug and fill the engine to the correct level with the specified engine oil. Allow the engine to idle for some time, switch off the engine and check the oil level again after approx. 10 minutes. Always bring used flushing oil, used engine oil and the old oil filter to a special collection point. Suitable for use as flushing oil in petrol, diesel and LPG engines for which a mineral, semi-synthetic or full-synthetic engine oil is prescribed. Not suitable for use as a permanent engine oil !